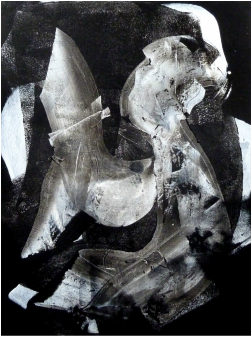 Two of Newel Hunter's black and white paintings-- Witness and Freeform -- have been juried into the first annual “Art by America, A National Review of Two-Dimensional Contemporary Art” in Chicago. The exhibition will be housed in The Art House and Elston galleries located in the Avondale art district for the entire month of June, 2015. The show will feature 250 artworks from 144 artists residing in America and working in the two-dimensional mediums of painting, drawing, photography, digital art, printmaking and/or mixed media. Newel Hunter is proud to announce that he has been selected to participate in an extraordinary exhibition at the Lee County Arts Alliance for the month of May, 2014 in Fort Myers, Florida. “Controlling Chaos: Aleatoric Art in the 21st Century” will feature 16 of the world's top Aleatoric Artists* displaying works in a variety of disciplines -- all with one thing in common: a willingness to "roll the dice" and collaborate with chance to create art of infinite beauty. *The Movement of Aleatoric Modern Artists is a hand-picked assemblage of 60 extraordinary painters, sculptors, photographers and craftspeople representing an emerging “period” in art history which has spontaneously occurred all over the world with uncanny simultaneity. From thousands of submissions each of MAMA's members were chosen for their willingness to “roll the dice” (the literal meaning of the root word “alea”in aleatoric) and to explore uncharted artistic territory by leaving a part of the creative process to chance.